A great way to keep up with all the good things Vision Resource Center of Berks County is doing in our community is by staying informed through our newsletters. 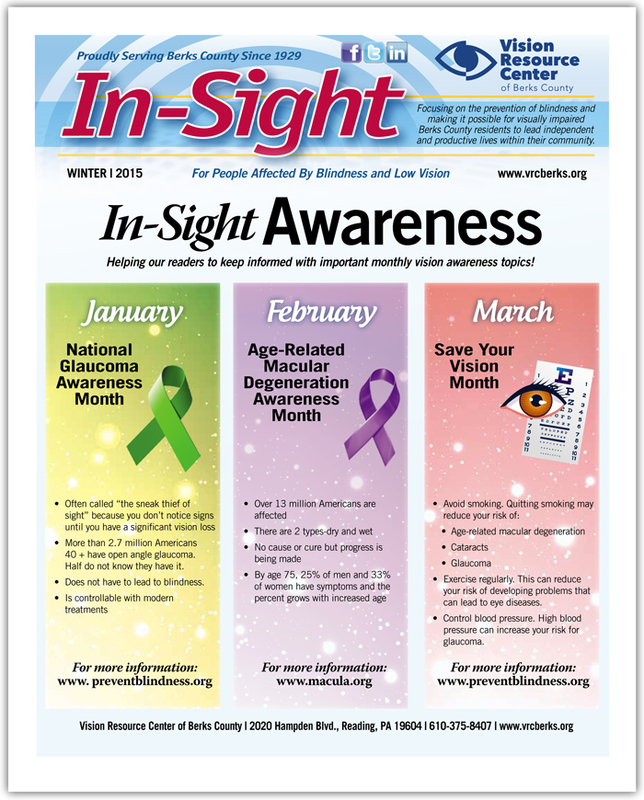 Please enjoy our Winter 2015 In-Sight Newsletter both in print and audio formats. A great way to keep up with all the good things Vision Resource Center of Berks County is doing in our community is by staying informed through our newsletters. Please enjoy our Autumn 2014 In-Sight Newsletter both in print and audio formats. A great way to keep up with all the good things Vision Resource Center of Berks County is doing in our community is by staying informed through our newsletters. Please enjoy our Summer 2014 In-Sight Newsletter both in print and audio formats. A great way to keep up with all the good things Vision Resource Center of Berks County is doing in our community is by staying informed through our newsletters. Please enjoy our Spring 2013 In-Sight newsletter below. A great way to keep up with all the good things Vision Resource Center of Berks County is doing in our community is by staying informed through our newsletters. Please enjoy our Autumn 2012 In-Sight newsletter below.